Oregon Wine Country Jerky is a brand owned by GJ Products, based out of Clackamas, OR. It's run by Glenn Loehr who started it in 2015. The company also owns, "Northwest Bierhaus Jerky". Together, the two brands infuse the flavors of craft beer and wine from the Pacific Northwest, and target the tourist and gift basket markets. 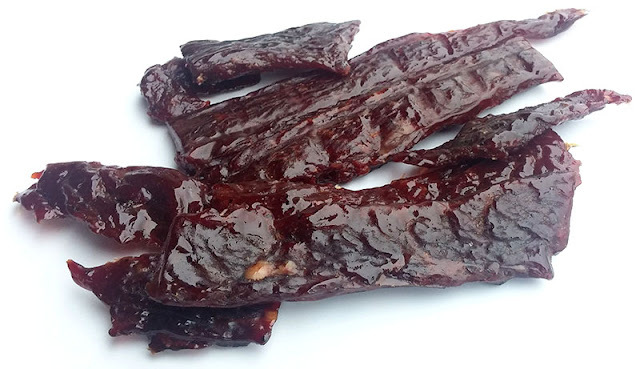 This, "Pinot Noir Beef Jerky" is described by the company as blending the complex flavor of pinot noir wine to create a, "...subtle yet powerful flavor of this one of a kind beef jerky". The first flavors that hit my palate is a lightly salty, wine marinade flavor. Some garlic and onion come in soon after. The chewing brings on more of the wine marinade, with a bit more of the garlic, onion, and salt. There's a noticeable sweetness to this too. For being marketed as a beef jerky marinated in Pinot Noir wine, it certainly lives by its billing. I do taste the unmistakable flavor of wine marinated beef. It's not a strong marinade, but enough that I can taste the unique flavor. There's even a light aroma as well. 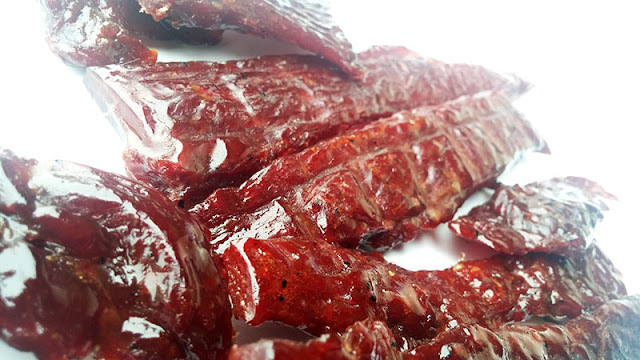 Otherwise, the primary taste profile is that of a wine marinated beef flavor, with a well noticeable garlic, onion, and salt flavoring, along with a light sweet. The meat consistency looks great. These are thick strips of whole muscle, appearing lean with little to no signs of fat. Chewing is chewy, and but still easy overall, and breaks apart easily. It takes on a meaty feel, with a little bit of a steak-like texture. Handling is sticky and lightly oily. 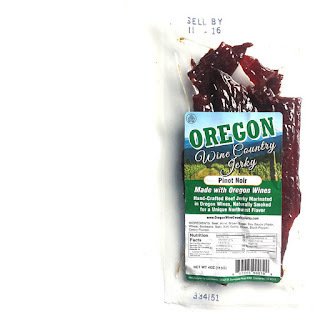 This Pinot Noir Beef Jerky from Oregon Wine Country does a good job of offering the unique flavor of wine-marinated beef. That fruity, earthy flavor comes in front and center and is then flanked by simple seasonings to create a very enjoyable snack. Overall, it's a mild jerky in spice that should satisfy all tolerances, and has a good balance between savory and sweet. But yet, after the first few bites, this jerky tends to lose my interest. The seasonings eventually takes over the wine marinade and it becomes plain snacking. It needs something else to generate pop and wow.